Today I woke up in one of those crummy moods. It happens to the best of us. Sometimes all it takes is one minor thing going wrong, no matter how small, to throw the whole day out of whack. Today happen to be my day. The last week of the month is always a little hectic for me due to how my job works, and I was just in “one of those moods”. Oh well. I usually just roll with it until it goes away, and being that I was going to be by myself all day I wasn’t worried about infecting anybody else with my rotten mood. I went to get dog food, as I do every Sunday. And as also happens every Sunday, someone carried the food out to my now-functional vehicle. Even though I can easily carry thirty pounds, they insist, and I always oblige. Today though, we came out to find that someone had double-parked, blocking me in the driveway. ARGH! Not to sound like an eighty-year-old lady, but the nerve of some people!! After a few minutes a gentleman came out of the restaurant next door, flashed a smarmy grin and me and said “Sorry! I was only going to be a second and thought I would be out first.” Well, you weren’t. The guy with my dog food said he’d better not ever think of doing it again, to which Mr. Important said “I am in a big hurry today, my time is important.” which clearly, being that after he got in his car he took a moment to flip through his iPod and mess around with a few other things, he wasn’t in THAT much of a hurry. Gah. I just hate inconsiderate people. I also hate it when people think their time is more important than someone else’s – just because he was wearing a business suit on a Sunday morning and I was wearing gross old jeans and a bandanna, I can only assume he was thinking I had nothing of even the smallest importance to do. And yes, I realize that it was literally only a minute I had to wait, but I was already cranky and it was rude. Anyway, this recipe is for you, Mr. My-Time-Is-Important. I realize that I am breaking a few of my blog rules here, but you break rules too so I figure it will appeal to you. It is also incredibly easy, and I figure that although you have Very Important things to do, you still have to eat at some point. And this really is a delicious recipe and one of my favorite things to eat. This makes a lot and I even eat the leftovers, something I never do. This recipe exists in many forms, so it is far from my own, but this is how I make it. I said that I was breaking rules because it is made in the Crockpot, and I used frozen veggies, both of which I have been avoiding. Anyway, start with about a pound of boneless skinless chicken breast. I used the little cutlets that are already trimmed (I was lazy and they were on sale). I am sure you could also use thighs if that’s how you roll. Anyway, take your pound of chicken breast and cut them into one-inch-wide strips. Have a bowl ready filled with a packet of taco seasoning mixed with some flour. I use just a handful or so. 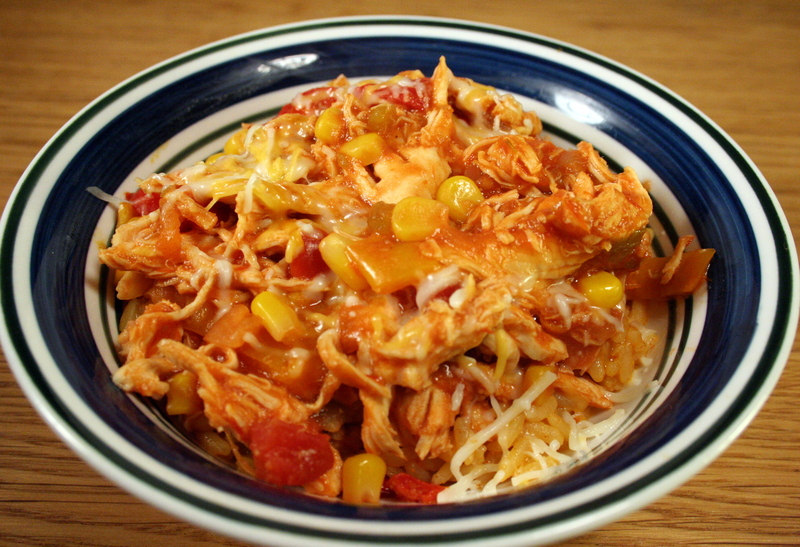 Dredge the chicken in the bowl and throw it into the bottom of the Crockpot. Dump in about three-quarters a bag of the frozen pepper and onion stir-fry mix. Then dump in half a bag of frozen corn. I also added some jalapeno peppers that I had floating around. The next step is to dump in a jar of CHUNKY salsa. The emphasis is on chunky because this is actually important. See, that’s how you know a recipe is going to turn out awesome, if one of the instructions is “dump whole jar of salsa in.” If you’re thinking about a regular jar of salsa you want to use up, don’t do it. Or do it and then don’t come crying to me when you have to take the time to make a roux to add to your watery Crockpot. Seriously. I used the Chi-Chi’s chunky salsa, which is really good (and I always shed a tear seeing the Chi-Chi’s logo on the jar – I LOVED that place and at times find myself shaking my fist at the heavens saying “WHY, Chi-Chi’s, WHY did you have to give those people Hepatitis and close down? !”) Then you mix it all up. Turn the Crockpot to low. Go do stuff for about eight hours. You can really do a lot in eight hours. Or four hours if you turn it to high. I took the time to get some work done, pet my dogs, watch Hoarders on Netflix and eat Nutella off of a spoon. The possibilities are really endless. When it’s almost done, I shred the chicken with two forks and dump it back in and mix it back up until it is done cooking. Sometimes, like I did today, I cook up some Mexican rice to serve it over. Sometimes I put some cilantro or scallions on the top if I have them. I always sprinkle some shredded cheese over the top. It may not look like much in this photo, but trust me – super delicious and insanely easy and cheap. I will happily eat the leftovers the next few days as I go through a frantic week. Without the cheese and rice it is just as good, and not that bad in calories. Yum. No matter how busy you are and how important your time is, you should totally make this. Yum! This sounds delish, i’m a fan of anything even vaguely Mexican. I too miss Chi Chi’s, is Hepatitis really why they shut down? That guy should get Hepatitis…people like that make me wish you were able to get a “free pass” once in awhile, i would have loved to just put your Jeep in gear and give him a good smash! Yup, it was hepatitis… I think from scallions. Chi-Chi’s was always the place we went for “family night” so i ave so many good memories of that place!! Their chicken taco salad was awesome and i haven’t found another place that had the same type of sauce as they did. That guy was such a jerk. The thing that made me the most pissy about it was that there was a spot in the street THREE spaces down. ARGGGH. This looks awesome. Seriously awesome. I miss Chi-Chi’s too. Then came Don Pablo’s and out they went as well. Evidently casual dining chain restaurants of the Mexican variety are doomed.